Money in the Garage: Free game system ....just for showing up! Josh hooked me up with this freebie! As demonstrated in last week's blog, when it comes to giving advise, I sometimes end up shooting myself in the foot. You might remember my story about Josh, a young guy running a yard sale. I made an off-handed suggestion that he use the words "old timer's garage sale" in his next Craigslist listing. This caused the garage sale sharks to to show up in droves at his house that fateful morning! Unfortunately for me, the early birds cleaned out Josh's garage before I could even step foot in his driveway! Once I did arrive, finding anything of value was similar to arriving late to Thanksgiving dinner-nothing but crumbs and cold leftovers! Josh's garage sale had been picked clean! But as I wandered around what was left of the sale, I eyed an old game system. 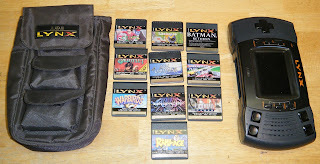 It was an Atari Lynx system in the original carrying case. As I looked it over, Josh told me it was his old gaming system going back to when he was a teenager. He further told me that the console wasn't working anymore. Talk about your crummy leftovers. I was left with nothing but a broken down game system-sheesh! Probably feeling a little sorry for me for missing out on the early morning deals, Josh told me I could have the game system for free. He pointed out that there were a few game cartridges inside the case too. I opened up the Velcro pack and counted about a dozen small games tucked inside. Doing some quick calculations in my head, I guessed the system was from the late 1980's. Since some vintage game systems can go for big money, I figured maybe this freebie could salvage my busted trip to Josh's sale. I thanked Josh for giving me his old game system, adding that I'd "play around with it." In reality this is Dude speak for, "I am selling it on eBay!" If you find this game-congrats! Josh was right about his game console-it didn't work. But I still had a bunch of games that could have sales potential. When researching games, I always type in each and every title on eBay hoping to find that one, super rare game that's worth thousands of dollars. This obsessiveness is rooted in a real life eBay success story. A few years ago, a woman innocently posted a Nintendo game system with a a bunch of duty old games. Thinking she would sell the whole lot for a hundred bucks or so, she was shocked to watch the bids rise into the thousands. The reason? One game in her auction lot was extremely rare. 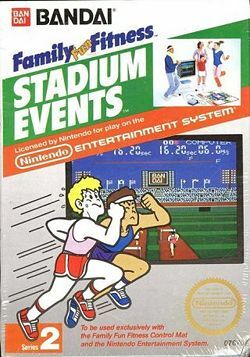 The game, Bandai's "Stadium Events" is known to have only 200 copies in circulation. When collectors spotted Stadium Events in the auction lot, the bids went through the roof. The auction closed at an unbelievable $13,100 dollars! Now you know why I look up every...single.....game! After doing my eBay look-ups, I found that while I didn't have a rare copy of Stadium Events, I did have a game called "Lemmings". Sold to a chap in Great Britain! I learned that Lemmings is a pretty big deal with buyers from England. Seeing it's popularity among U.K. collectors, I posted the game for a "Buy It Now" price of $50 dollars. Proving my research was spot-on, it sold just hours later to a chap in England! With my best game now sold, I posted the remaining games and the broken console in one big lot. Seven days later, the system and the games sold for $29 dollars! So even though I arrived late for the party at Josh's garage sale, I still received a great consolation prize! Josh's freebie netted me a total of $79 dollars-not bad for a garage sale leftover! Nice! That's a niche market that always seems to do well. $32 dollars ain't too shabby....Dude! I once helped my mother-in-law conduct an estate/garage sale for the parents of a doctor friend of hers. She didn't want to go near the dust- and dead-roach-infested bedroom closet and told me I could have any of the shoes I wanted since I had helped her so much. Choosing them only because they were different (not knowing if they were worth anything or not), I picked out a pair of vintage Riddell referee shoes and some suede Converse tennis shoes. Put them on eBay several months later and the Riddell shoes sold for about $130 and the Converse sold for $667 to someone in Japan!!! Barbara- I don't think you told this story before. Even if you did, it's worth repeating! Wow...$667? The Japan market never ceases to amaze me! Thanks for the great story....Dude! Excellent creative thinking! Adding those $3 dollar bells was like adding the cherry on top! Although I can't recall ever running across clown shoes, I am definitely putting them on my list now...Thanks for writing in...Dude! I wanted to tell you how much i enjoy your articles. i have been reading them since you began. I am julia from orange city florida and i have been yard saling my whole life and selling on ebay for around 15 years now. it has helped us raise 4 kids football cheerleading karate expenses and pay bills when necessary. i love living in florida the garage sales are awesome as we have no attics or basements for storage and people yard sale all 12 months out fo the year. i have learned so much since i started. Julia-Thanks for the nice comments. Glad this blog gives you some inspiration! One of my reasons for posting this blog is to financially help out my fellow yard sale brethren. Like you said, a good eBay flip can pay for a saturday night restaurant trip with the family, sports sign-up fees and other common expenses we all face. I've been a little lax this past week in blogging. Have my next piece roughed out but just don't have the energy and the spare couple of hours to put the finishing touches to it. But it should be out soon and hopefully you'll like it. Thanks again for writing in....Dude! My great find this week was going to a thrift store in a ski resort town (Ski Resort Town= Too Much Money). I bought a Kelty Kid Carrying backpack for $10 in excellent condition. Since I am only visiting and had to fly home at the end of the week, I threw it up online for $80 and sold it in less than an hour. Great extra spending money for this vacation! PS, I went into the thrift store to buy toys for my son since I wasn't flying toys around the country. Sure wish I had time to sell his toys before we leave as well. $.50 for $50 toys! Suzy- I love the Kelty backpack flip-way to hustle while on vacation! That'll pay for a dinner or two! Too bad about the thrift store toys...keep trying right up until you have to leave for the airport! Thanks for checking in even while on vacation.....Dude! My husbands boss replaced his iPhone and his car's radio. The iPhone didn't work so he gave it to DH so he could "tinker" with it. He was going to throw away the old car radio, which worked perfectly, but DH ended up with it. I sold the iPhone for parts for $169.40 and the car radio for $50. Not only did we make some money, but kept that trash out of the landfill!